a) Thought her watch must be wrong. You’re too sweet a girl to come home that late. She took a minute to fluff your pillow, then set out your favorite jammies. b) Waited to 2 AM? As if. After calling the police at 12:05 AM, she used the GPS device implanted in your skull to track you down. Plus you’re grounded, so grounded. c) Didn’t even notice. When you rolled into the driveway she was passed out on the lawn with a bottle of Jack Daniels in both hands. d) Sends you straight to bed, wakes you up at 6:30 a.m., then announces you’re grounded for a couple weeks. a) Just sit down and have a cookie. It’s stressful enough being a student, and you’re fingers already get a workout from all that texting. b) Learn how important a clean house is. When you scrub the toilet, make sure to get behind the tank, and the kitchen floor? There’s a spot in the far left corner that needs more attention. And don’t forget to iron your underwear. c) Do it all. Get the groceries, cook the meals, wash the dishes and the laundry. Come on, those National Enquirers don’t read themselves, you know. d) Make your bed, set the table, plus a few extra chores on the weekend. It’s not asking too much, is it? IS IT? Now go upstairs and clean your room. It’s filthy. a) Is ten steps behind you, waiting patiently. She knows how embarrassing shopping with Mom can be. Just being your wallet is reward enough for such a special daughter like you. b) Grills her about last Saturday night, since ‘her own daughter never tells the truth.’ Was there any alcohol at the party last Saturday? Who’s this ‘Brandon’ kid that just became a Facebook friend? Details! She needs details! c) Asks her if she has a spare cigarette, then ditches you for the tattoo shop so she can check out the flash. d) Gives your friend a polite ‘hello,’ asks how her mother is doing, then says she’ll meet you at Coldwater Creek. a) Tells you ‘her princess’ looks beautiful and, if you’d like, she has some green eye shadow that would match your bustier perfectly. b) Drops to her knees wailing, “I can’t believe I’m raising one of those type of girls.” Then calls the pastor for an emergency intervention. d) Says a smart, pretty girl like you doesn’t need to look like ‘that’ to find a nice boy. Then she sends you back up to your room to change. a) Takes you to the salon for a mani/pedi, then it’s off to the mall. Nothing like a new pair of Uggs to make those blues go away. b) Turns four shades of purple, calls all your friends parents and announces your social life has been frozen indefinitely. Then she dumps your cell phone into the trash and arranges a tutor for every Saturday night. d) Realizes it’s only one test, but wants to make sure it doesn’t turn into a pattern. She sits you down so the two of you can figure out a plan to get things back on track. a) Brings you breakfast in bed, then hands you her credit card and car keys. After all, her pumpkin can only wear the latest summer fashions. When you get back you’ll have to work - on your tan. b) Presents you with workbooks on every subject. You’ll need to get a jump on next year’s curriculum, and the SATs are coming fast. c) Tells you to scram. Just because you don’t have to go to school doesn’t mean you can lie around all day at home. That’s her job. And speaking of jobs, you better go get one. Someone’s gotta pay the bills. d) Gives you a day to relax, then asks you to come up with a plan for the summer. All work and no play makes Jill a dull girl, but all play and no work? Ain’t gonna happen. If you answered mostly (a)…Your mom is a CREAMPUFF. Boy, life sure seems cool right now, but a reality check is in store. The world ain’t your oyster, chickie. Be prepared to buck up once you leave your heavily feathered nest. If you answered mostly (b)…Your mom is a PSYCHO. Sure, life is tough living under a microscope, but at least you’ll live to see eighteen. She’ll make sure of it. That is, of course, if you can survive her. If you answered mostly( c)…Your mom is a LOSER. And I don’t mean as in “America’s Biggest.” But keep in mind, she’s a great role model. Just do the exact opposite of whatever she does and you’ll be fine. Just be prepared to cringe… a lot. If you answered mostly d…Your mom is NORMAL. Kind of. Remember, we’re talking normal for a mom. And although this is little consolation, remember you could have it worse. Well there you have it. Feel enlightened? I didn’t think so, but hope you had fun anyway. 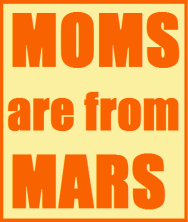 Remember, all moms may be different, but they share one thing in common: all moms are weird. That’s whey you’re here, isn’t it? * Okay, okay. You got me. 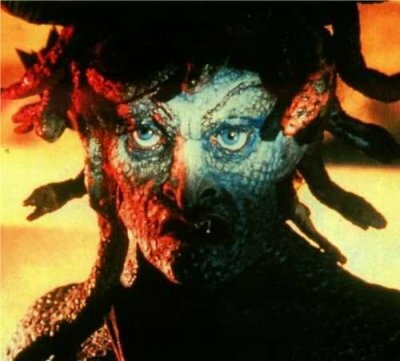 It's Medusa from the 1981 classic, Clash of the Titans. Good movie, BTW. Check it out.